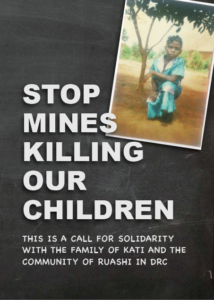 At 12 pm on 14 November 2017, Kati a 11-year-old school girl, on her way home from school was instantly killed when a flying rock from blasting operations of the Ruashi Cobalt and Chrome Mine crushed her head. She lived with her family in the Masangoshi district of Ruashi located on the perimeter of the Ruashi Mine, just outside Lubumbashi, DRC. When Kati was killed the company called the family and gave them food items for the funeral. The company said they would help the family, but asked the family to keep away from activist groups. The company paid the family a small compensation far below what the family asked for. 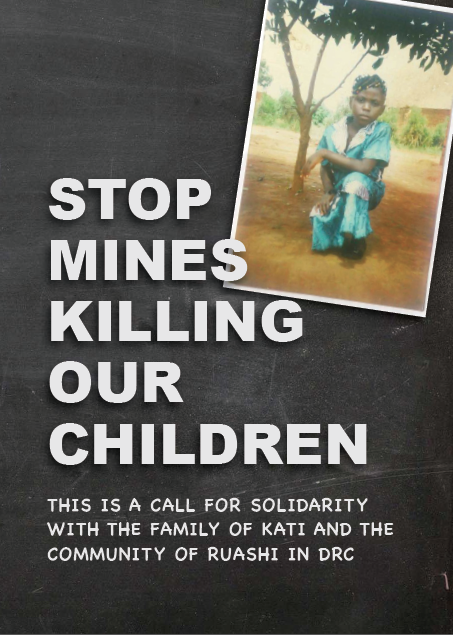 The killing of Kati has brought a terrible fear and great anger into the Ruashi community. Community members say that the mines recently increased the size of the explosives which sends rocks flying into their living area. This has added a new dimension to the great suffering the community has faced since mining started in their area. The community live on the edge of the open-pit copper and cobalt Ruashi Mine. operated by Metorex a company based in South Africa and owned by a Chinese corporation, the Jinchuan Group. The group has two mines – Ruashi Mining in the DRC and Chibulma Mines in Zambia. The group also has shares in Wesizwe Platinum in South Africa. The community were forcibly relocated and with the expansion of the mine they now face a second relocation. The community is willing to move but on condition that all residents be moved together, that the new location has space for gardens and cattle, and that they have a guarantee that they will not be asked to move again. The community is still waiting for the company to talk directly to them about the relocation. To date the company has approached individuals in the community who do not represent the community, and has ignored the true representatives of the people. Government officials have also not been helpful. They do not consult the community or speak on the community’s behalf. Instead they work closely with the company. 3. That the company meets with community representatives directly on a relocation plan and gives an undertaking that they would be moved together, that they would have water and land for their gardens and cattle and that they will not be moved again. The Ruashi Mine is an open-pit copper and cobalt mine operated by Metorex. Metorex is a mining company based in Johannesburg, South Africa. It has mines in the Democratic Republic of the Congo (DRC) – Ruashi Mining and Chibulma Mines in Zambia. Metorex is now owned by the Chinese state owned corporation Jinchuan Group . Metorex is valued at US$1.1 billion. The Jinchuan Group also has a 44% stake in the South African company WeSizwe Platinum (in which Anglo Platinum has interests with large BEE shareholding). Metorex shares directors with WeSizwe. The Bench Marks Foundation and Southern Africa Resource Watch call on organisations to support the demands of the Ruashi community. 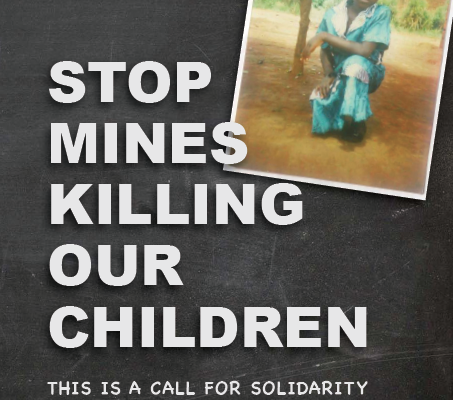 Action in solidarity with this community is action in solidarity with the many communities living near mines, on our continent, whose basic rights are violated by global corporations and with the support and collaboration of government officials. The petition calls on the the owners of Ruashi Mining to respond to the demands of the Ruashi community . The Bench Marks Foundation and SARWA offer to facilitate a meeting between the the mining company and the community. The petition will be handed to Metrox who operate Ruashi mining. Arrêtez les mines qui tuent nos enfants !